The Bugatti EB110GT was one exotic and very limited production speed machine. Unveiled 110 years to the day of Bugatti founder Ettore Bugatti’s birth this ultra premium sports car has little in the way of equals either in terms of speed and acceleration and styling. Some in the auto trade and automobile reviews crowd said that the EB110GT was over hyped and in a way over-engineered. Yet this short lived automotive classic was an archetypal example of motoring excess and excesses. It might be said that this piece of exotic hardware was way out – excess in performance, excess in equipment and certainly excessively expensive and costly. But a lack of sales did not mean that this was no classic car regardless. Bugatti- the original Bugatti that is – had stopped making cars soon after Word War 2, but it was not until 1986 that Italian entrepreneur Romano Artioli managed to buy the trademarks. With boundless ambition, he then set out to build a new mid-engined-two-seater which would out-do anything that Ferrari, Porsche, Lamborghini or Jaguar could muster. In his mind the new car, which the titled tEB110GT would be more extreme that its opposition – five valves per cylinder instead of four, four turbochargers instead of normal aspiration, six speeds instead of five, and four wheel drive instead of rear-wheel drive. Not only that, but he would have it styled by Marcello Gandini (who already had the Lamborghini Miura and Countach to his credit) while the engine would be designed by a disaffected team of ex-Lamborghini engineers. To cap it all, and in a deliberate provocation of his rivals, it seemed there would be a new factory at Campogalliano, on the outskirts of Modena. Engineering was overseen by Nicola Materazzi (who had run the Ferrari F40 program at Ferrari). A carbon-fibre composite was chosen for the chassis (which meant that expensive autoclaves had to install at Campogalliano) and well before the prototypes took to the road, the hype began. At first, however prototype cars were built with welded/fabricated alloy chassis and there was much to do, with the engine and transmission. The engine itself, no doubt, was a technical masterpiece indeed with five valve heads (three inlets, two exhausts) and with forced introduction by four small IHI turbochargers – two to each bank, each one being powered up to three cylinders and feeding high-pressure mixture to the same cylinders. The clever part was ensuring that everything worked well together – and they sure did 100 %. When the four-wheel-drive was being engineered, Bugatti had obviously taken lessons from both Porsche and Lamborghini, for there was rigid alloy tube linking the engine to the front diff, the center power split directing only 27 % of engine torque to the front wheels. Because Artioli, after all was not superseding an old model with his new EB110GT, no secrecy was needed, so the prototype was launched in a blaze of expensive glory in Paris, more than a year before the first production cars would be delivered. When tests cars were supplied, experts found out that all the claimed performance – including a top speed of 213 mph – was authenticated, and that the handling and traction were well up to supercar standards. 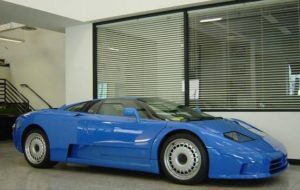 As with the rival Jaguar XJ220, Artioli’s problem was that the EB110GT became available the European economy crashed, which caused most if not all of his probable clientele to cancel their orders. The project staggered on until 1995, then went spectacularly bankrupt, and only a handful of EB110GT’s were ever delivered. In Modena itself, no trace of the project remains what so ever.